Today I woke up with a craving for corn bread. But I wanted it to be sweet, soft and made with cream of corn. Have I ever mentioned how much I like cream of corn? No? Well then, there you have it, its right up there as one of my all time favorite things to make things with. I have a great cream corn soufflé casserole recipe that I love (so does my family). The thing is that it takes a lot of steps to make it, plus is baked in a water bath, which gives you a whole other set of issues to deal with. I was not in the mood to deal. So I did what everyone in their right mind would do when they have a craving. I Goggle searched until I had 5 possible recipes to try. Each one had something that I like so I used it to inspired what I created today. 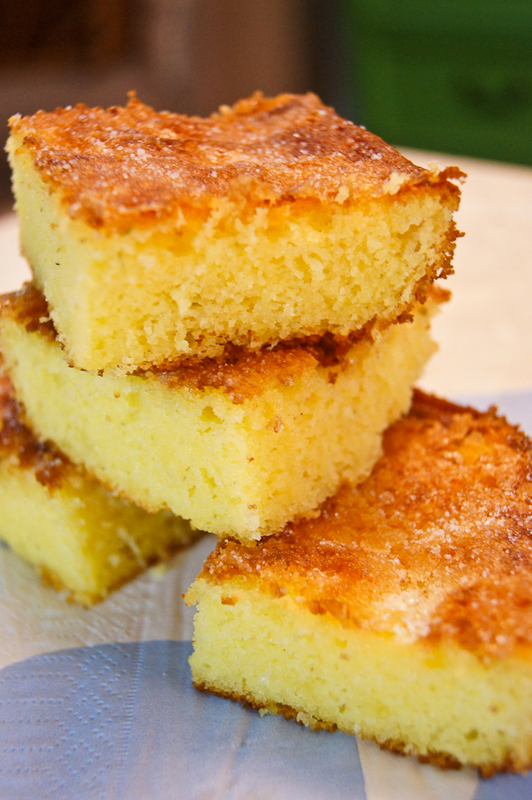 Not a soufflé type corn bread, more like a sweet corn cake but just as good. And surprise - no cream of corn in any of them. The most important thing is that it was fast, easy and took care of my corn craving. Preheat oven to 350°F. Grease 10-inch square baking pan. Separate egg whites from the yolks. Mix egg yolks with sugar, oil, lemon zest, yogurt, vanilla extract and baking powder. Stir in corn meal and semolina flour. Whip egg whites until foamy and form stiff peaks. Fold in egg whites into yolks mixture. Pour the mixture into greased pan. Sprinkle the sugar all over the surface of the mixture. Bake for about 40-45 minutes until golden and the top is caramelized. You can also make sure that is done by inserting a toothpick in the center and comes out clean.